The Chemistry Department at the University of Colorado Denver is now recycling waste acetone that is generated in teaching laboratories. Through conversations between the Chemistry Department and the university’s Department of Environmental Health and Safety (EHS), it was discovered that the teaching labs at CU Denver could greatly benefit from reusing their waste acetone. EHS realized its recycler, which was infrequently used, would be an endless resource at CU Denver; so EHS donated the recycler to the Chemistry Department. The recycler was previously located at the CU Anschutz Medical Campus but was underutilized because researchers there usually require very pure chemicals for their work. The recycler is a better fit for teaching labs because they use large amounts of acetone to wash glassware, as solvent for cooling baths, and even as reagents, all of which do not require the purity that is required in research labs where the requirement for precision is extremely high. Students in the teaching labs collect their acetone waste stream from their experiments and instead of disposing of it as waste, it is recycled and reused in the same labs. 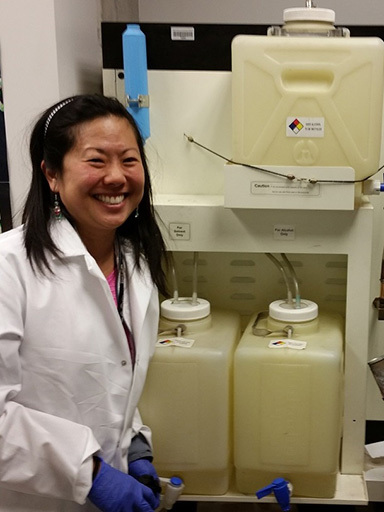 Since January, Pam Nagafuji, Organic Chemistry lab coordinator, has recycled 260 liters of waste acetone, saving the department over $700. “We used to purchase about 15, 20-liter containers of acetone per semester, but with the acetone generated from the recycler we have only needed to purchase two containers this entire semester” says Cathy Rathbun, General Chemistry lab coordinator.